Nikola Šubić Zrinjski zacijelo je najpopularnije hrvatsko glazbeno scensko djelo. Oznaku narodnog djela zavrijedilo je povijesnim konotacijama te mu i zbog toga pripada aura umjetničke tvorevine za sva vremena. O strogo glazbenoj vrijednosti toga djela, odnosno o nekim manjkavostima libreta, mnogi su povjesničari glazbe, muzikolozi i kritičari rekli svoje. Zrinjski je, međutim, prošao mnoge kušnje vremena, estetičkih i inih prosudbi, te uspio prebroditi negativne ocjene izrečene glazbenom i pjesničkom tekstu. Danas mu, međutim, više ne treba obrana. Djelo govori samo za sebe. Praizvedba Zrinjskog (libreto Hugo Badalić) bila je 4. studenoga 1876. u Zagrebu u tadašnjem Narodnom kazalištu. Dirigirao je sam autor. U riječkim dnevnim novinama La bilancia četiri dana kasnije objavljen je kratki prikaz u kojem se Riječani prisjećaju Zajca i smatraju ga svojim: "Nikola Šubić Zrinjski. Ovo je naziv novoga djela (glazbene trilogije) vrijednog našeg sugrađanina, maestra Zajca, predstavljenog prvi put prošle sedmice u Narodnom kazalištu u Zagrebu, na libreto gospodina Badalića. Uzdržavajući se izvijestiti o vrijednosti nove partiture, jer su nas o tome obavijestili zagrebački listovi, kao i prijemu kod tamošnje publike, utvrđujemo sa zadovoljstvom da je, po Agramer Zeitungu, vrijedni umjetnik doživio brojne ovacije, koje su dostigle vrhunac kad su se poslije treće slike na prosceniju ukazali predstavnici pjevačkog društva Kolo i poklonili kompozitoru veličanstvenu krunu, ukrašenu kićenom vrpcom nacionalnih boja." The Imperial Hall is a domed hall in the Harem, believed to have been built in the late 16th century. It has the largest dome in the palace. 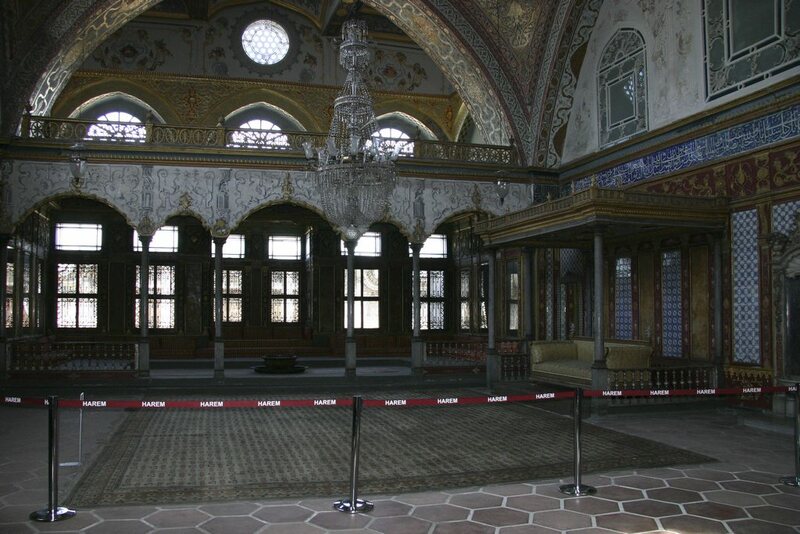 The hall served as the official reception hall of the Sultan as well as for the entertainment of the Harem. Here the Sultan received his confidants, guests, his mother, his first wife, consorts, and his children. Entertainments, paying of homage during religious festivals, and wedding ceremonies took place here in the presence of the members of the dynasty. After the conquest of Istanbul, Mehmet the Conqueror chose a site on the Forum Tauri - Beyazit Square for his first palace. So called "Old Palace" is referred to in the sources as a walled complex, altough no traces of it now remain. It features, however in some old maps and plans of Istanbul, on the site of the present University Of Istanbul main building. It is though that the walls surrounding the university building follow the original walls of the palace, while the main portal is thought to have been where the present ent rance is. Another portal looked out to Süleymaniye Mosque. After the construction of Topkapi Palace, the old palace became the abode of the members of the Sultan's harem who had lost favour of the wives of previous sultans. At one point it is known to have have had a broad eaved Baroque portal. Not long fater the conquest, Mehmet II began the construction of a new palace at Seraglio Point, wich became known as Topkapi Sarayi after a shore palace near the Cannon Gate (Topkapi.) of the sea walls. The walls surrounding the point, which known as the first hill of the city , were 1400 ms in lenght.The old Byzantine sea walls on the Sea Of Marmara and the Golden Horn were linked up with land walls enclosing the palace, known as the Sur-i Sultani, and supported by 28 towers. The main gate was the imperial gate "Bab-i Hümayun" behind the Ayasofya. The gate was formerly surmounted by a keep which was later removed. The flanking bays in the gate were also revetted in marble. The new palace was begun within these walls between 1472 - 1478, and construction continued thougthout successive eras with additions being made right up to the mid. 19 century. The palace complex inculudes lodges, pavilionsi state offices, dormitories and barracks and private quarters, a mosque, library and huge kitchen, The last pavilion to be built on the site was the Mecidiye Köskü which is at present open to the public as a restaurant. Several pavilions and villas in the palace grounds on the point were burnt down during a fire in 1863. All trace of them was lost on the construction of present railway at Sirkeci. In the first court, entered though the Bab-i. Hümayun, only two imperial pavilions have survived in good repair. Topkapi Palace became a museum in 1924. It has undergone a number of restorations since then. The first courtyard, also known as Ceramonial Court - Alay Meydani., contains on the right the offices of Ministry Of Finance - Defterdar Dairesi and on the left. Hagia Eirene the Ottoman armoury. The road leading to the second gate passes between these two buildings. The second portal, which is flanked by towers, is the Bab-üs Selam -The Gate Of Respects- which dated originally from the period of Conqueror. but which underwent some alterations to the towers during the reign of Süleyman I. During the reign of Mustafa II. a broad aeved bay was added to the inner facade of the portal. Entering through this gate, one passes into the second court which marks in the true enterance into the grounds of the so called Saray-i. Cedid (New Palace). On the right of this court are the pantry guards' barracks, the kitchens built by the architect Sinan, the cook's domitories, a bath, the chief stewards's office and the larder. On the left a road slopes down to the barracks of the Crestes Halberdiers adn the imperial stables, the livery treasury and the Mosque of Besir Aga. Further along the court on the left are the double domed chambers which housed the Imperial Council Of Viziers .This was built by Süleyman I, and it was from here that the state was ruled for a long time. A rectangular tower abutts onto the domed chambers. This was the palace watch tower It was built in the time of Mehmet I but later altered. The upper storey was timber-built until 1860. The tower was given its present apperance during the reign of Abdülmecid. The Harem is entered via a door beside the domed chamber, and to the right is the entrance to the imperial records office. The gate at the other end of the second court, the Gate of the White Eunichs, gives access to the third court, the privy court or Enderun. This gate dates from the reign of Selim III, and has a broad eaves. It was under the eaves of this portal that the imperial throne was set during court ceremonies such as those of alliegance, religious celebrations and public audiences. The imperial pennant was erected here too at certain times. The gate was flanked by the chamber and barracks of the White Eunichs. The third court contained the Throne Room. The building dates from the reign of Mehmet II, altough the door and decorations date to the 19 century. The overhanging eaves of the building are eleganted to cover a columned arcade, and the walls are recetted with faience. The building was used mainly for imperial audiences to viziers and foreing envoys. Behind the throne room is the library of Ahmet III - Enderun Kütüphanesi. It is the largest and finest library in the palace. On the right of the court was the Enderun school, artists' and musicians atelier, the barracks of the Campaign Pages, the Treasury, formerly a pavilion in the time of Mehmet II and the remains of a bathhouse dating from the reign of Selim II. On the left of the court is the Treasury of the Sword-bearer. (Silahtaragasi.) and the apartments of the sacred relics. Further to the left is the vaulted mosque of the white eunichs. The Aka..alar mosque has been restored and now houese books and manuscripts collected from all parts of the palace, as the Topkapi. Museums Library. The sultan's private kitchen is a small building behind the mosque adjacent to the second entrance of the Harem. Two slightly ramped alleys lead from the third to the fourth courtyard. Flanking the alley to the right barracks of the cellar slaves( Now the administrative offices of the palace.) and the barracks of the treasury guards. To the left of the alley on the left are the chambers of the scared relics. The fourth court is a spacious garden, sometimes called the tulip garden - a misnomer based on the word "lale". The actual title is the "Lala's garden". The chief court physician, or Lala's tower is set on the edge of the terrace overlooking a lower terrace garden. This was the palace pharmacy. On a terrace wall a litte further on from the tower is the pavilion of Mustafa Pacha, also known as the Sofa, which dates to the beginning of the 18 century. It is a fine example of Turkish tradition, decorated with occidental-inspired motifs. To the left of the court is a stone paved terrace adjoining the chambers of the sacred relics. The terrace extends from the arcade fronting the chambers, and contains an attractive pool. It is reached from the gardens via short flight of steps abutting onto Revan Pavilion, also called Sevk Odas1., which was built by Murat IV in 163. This is an extremely finely decorated pavilion. Manuscripts originally kept in bookcases in the pavilion were later transferred to the museum library. At the end of the terrace on the right, dominating the wiev of the Golden Horn and the Bosphorus is the Baghdad Pavilion, built after Murat IV's second conquest and interior, decorative dome and vaults and mother of pearl inlayed doors are among the most striking of its elegant attributes. At the edge of the terrace overlooking the city and Golden Horn is gilded bronze baldachin, which has four fine columns supporting an eaved cupola. Along the eaves runs an inscription frieze containing a long poem which informs us that the baldachin was built by Sultan Ibrahim as a place of vigil. Below it is the figgrove, or lower garden. To the left of the terrace, just opposite the chambers of the relics is a small chamber known as the Cicumcision room. This was built by Sultan Ibrahim in 1641, and is decorated with fine tile panels dating to the 16 century but which are reused on this building. The window panles contain small fountains and a long poemis inscribed on the facade. Two pavilios of note are also to be found on the Marmara side of the fourth court, the Çadir Pavilion and the Mecidiye Pavilion built by Abdülmecit I. The letter is European in style and is the final building to be built in the palace complex. It is flanked by a small wardrobe room (Esvap Odasi) and a small chapel mosque with minaret (The Sofa Mosque). A path leads down the terrace from the Mecidiye Pavilion to a gate which gives access to the outer gardens of palace also known as Gülhane Park. A large number of pavilions and royal summer villas were once to be found in the seraglio gardens, but were brunt down during a fire in 1863, and all trace of them disappeared during the building of the Sirkeci railway which passed through the promontory at this point. Some drawings and plans of these pavilions do, however, exist.